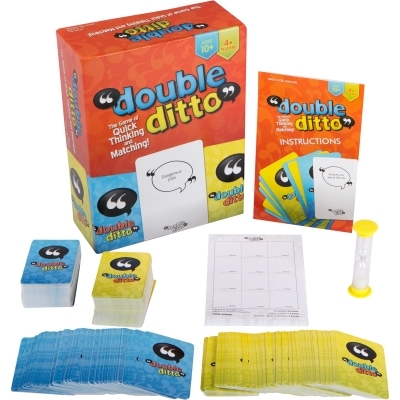 Double Ditto is a new party game that will challenge players to be clever and quick. Play 4 to 10 or more players. Double Ditto is fast-paced, easy to learn, family friendly, and filled with lots of laughs. A great way to encourage English language learning. Fun game for a group- great participation. Looks like such a fun party game! I like that it can be played with lots of people of all different ages. It seems like it would be great to create camaraderie in groups that may not know each other well. This sounds like a really fun game my family and I would love to play. I love the colors of the packaging.